For over 25 years, Dr. Coleman’s commitment to giving back has extended across borders, as he has made multiple medical mission trips and other outreach initiatives an integral part of his purpose. As a member of various global organizations including Baptist Medical Dental Fellowship (BMDF) and International Medical Outreach (IMO), he has been fortunate to share his talents all across the globe. In 2009, he traveled with IMO, a group of volunteer dentists and physicians, on a medical mission trip to Central America where he had the opportunity to provide nearly 300 underprivileged Honduran children with free dental care. 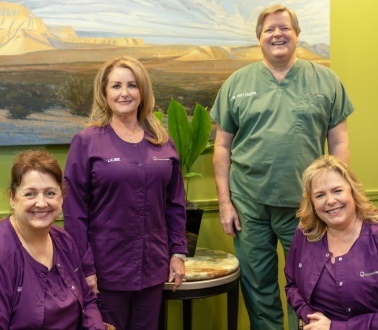 Most recently, however, Dr. Coleman went to Alaska and Peru on mission trips, and also donated his time and services to Give Back a Smile, a national organization providing survivors of domestic abuse with no-cost restorative dental care. Locally, Dr. Coleman donates his time to a variety of efforts. When he is not in the office crafting stellar smiles, he shares his experience and artistic approach with dental students at the University of Texas Health Science Center at Houston as a clinical adjunct professor. He also lends his talents to the Alley Theatre where he collaborates with the actors and artists to create special dental effects for the performers. Besides being an Eagle Scout, Dr. Coleman serves on the board of directors for the Sam Houston Area Council of the Boy Scouts of America, where he volunteers with local Troop 13. The organization commended his dedication and leadership by presenting him the prestigious Silver Beaver award for his distinguished service. In addition, Dr. Coleman is also a deacon at Houston’s Second Baptist Church and a Regent at Stephen F. Austin State University. Mon: 8 a.m. — 5 p.m.
Tues -Thu: 7 a.m. — 3 p.m.